The Aseseeso Mountain Chalet is an eighteen foot (diameter) round residence. The structure is two storeys with stone foundations and an Earthbag wall system that is structurally reinforced with the appropriate concrete columns and continuous lintel beams. This house in Ibicoara, Bahia Brazil was completed in late 2011. We were approached by an earthbag workshop participant in mid-2011 to run an eco-architecture workshop in the north of Brazil, in Bahia. This very energetic lady, Miroca, with a huge heart and huge vision for her ‘sitio’ wanted us to design as well as construct the centrepiece for her new Eco Institute she was forming on her rural property in Bahia – and she wanted it done very quickly! Texas Stonehenge is what Clay DiMeno calls this bunker/tornado shelter/man cave that he made with earthbags and a lot of creative ingenuity. It is a 20 foot diameter round house. He carved the plaster to look like stone, and this is very convincing. This is mostly a pictorial description, with occasional commentary of how he made it. This Puerto Vallarta Model House is a design for a reinforced two-story earthbag building that might pass code standards for most seismic zones around the world. It is especially adapted for hot, humid climates, with large earthbags filled with adobe soil that provides both insulation and thermal mass. Most of the structure is bermed about a meter high with substantial planter beds. The roof is insulated with large bags of recycled styrofoam. Nearly all of the direct sunlight into the house is excluded with large overhangs and buttresses. And the breathable interior walls will help moderate the humidity. In this Brazilian Ecological House the walls are made solid with PURE EARTH! The curves are essential in SUPERADOBE projects...they express sensuality and provide strength. This project was constructed partly in brick and partly in superadobe...and certified wood! A hybrid house. This house is a concrete example of how your new home can be sustainable without losing elegance. This House in Patagonia features a double wall system that includes pumice. Five hundred tons of earth have been moved by hand. The house has a spectacular view, is very cozy and has a very simple exterior. The earth system keeps the surrounding earth warm and dry in what is an extremely wet and windy environment. Amirta - Divine Nectar Retreat Cabin in the high desert of southeastern Arizona. To do this retreat Venerable Lobsang Gyelse must build a space to do it in, which is a small circular meditation space with an offset sleeping nook. In addition there is a covered porch area. Kitchen and bath are in a nearby building. This project was fully permitted and inspected by the authorities. Hyperadobe Step-by-Step describes how to build with net bags or tubing, an innovation of Fernando Pacheco, a Brazilian engineer. With vertical walls there is no need for barbed wire between the layers because with the open netting the soil of the bottom layer is merged with the new layer above. This leads to less cost compared to the poly bags. Freeform Earthbags Between Boulders were used to create this contemplative space at Phangan Earthworks in Thailand. It is a rather luxurious "cave" that artfully combines granite, wood and earth. It has a 60 sqm ground floor divided into three rooms on three levels, topped by a 15 sqm loft. Baraka's House evolved after she asked me to help her design her custom earthbag home. She had very specific ideas about the shape and room arrangement, but wanted some input as to what was practical with earthbags and how to accomplish many details of construction. She also wanted a passive solar design and wanted my my advice about this as well. This tastefully designed home was built on a shoestring budget by owner/builder Alison Kennedy in Moab, Utah. The 1,000 square foot earthbag home is the first permitted earthbag house in Utah. Alison in-filled earthbags between concrete and wood posts. A concrete block bond beam was mortared into place on top of the wall. Described by Kaki Hunter and Doni Kiffmeyer. In April of 2010 Owen Geiger conducted an earthbag workshop in Thailand. The project chosen for this was a Roundhouse, and the workshop and the resulting roundhouse were a resounding success. The main impression is one of incredible fortresslike strength - massive walls with no sway. For our roundhouse, we wanted things to look nice, of course, but we didn't want to spend a fortune. This Community Center in Peru was constructed by a team of volunteers of the organization Pisco Sin Fronteras from November 2010 to January 2011. The first stage of the construction of the earthbag wall is to fill the bags with slightly moist earth. We put barb wire between each layer of bags to prevent them from slipping out of place. We introduce vertical pieces of rebar every meter of wall length to reinforce the walls. Theo describes the building of The Sun House in Haiti. "Rice, barley, wheat all come in poly bags which we've saved. They will be used to hold a mix of moistened sand and clay. The bags will be laid out much like bricks or blocks and barbed wire will be used as mortar between the rows." Project in Belize This project is presented primarily as a photo essay, but the wealth of details makes it nearly self-explanitory. 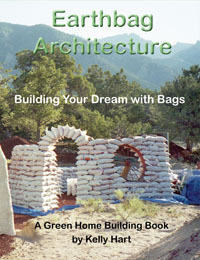 Kaki Hunter and Doni Kiffmeyer, the authors of Earthbag Building are present, and their trademark methods are employed. Steve and Carol Escott built a two story home on the remote island of Rum Cay, Bahamas, assisted by Kaki Hunter and Doni Kiffmeyer. This Sand Castle features a first floor made with earthbags filled with sand and crushed coral, upon which a second story, framed house would be constructed and covered with a hip-style roof. Robin's House built near San Miguel de Allende in Mexico is based on a traditional Southwestern adobe and has an open floor plan. Several Eternally Solar Earthbag Projects in South Africa demonstrate a unique approach that features poly bags that have been partitioned into three compartments lengthwise, so that the two outer compartments can be filled with soil while the central compartment is left unfilled and creates a void to insulated the center of the wall. In planning to build an earthbag house in Belize, Central America, I decided to first build a smaller Garden Shed so that I could teach myself the process, learn from my mistakes so as to avoid making such mistakes when applying the technique to a large living space and, finally, so that I would have a place to store all the tools and equipment I would need onsite to actually build a mud house. Bois Marchand Earthbag House is a simple earthbag structure built by the Haiti Christian Development Project in about a week by 7 laborers. It follows many of the recommended techniques you will find at this site. The construction of an earthbag Round House is carefully chronicled with details about foundation, windows, doors, roof framing, flooring, plastering, etc. There is even a lovely bottle wall (as pictured here). This project is very well documented and well made. Brandon Rogers' Ghana Residence is located in the eastern region of Ghana near the township of Akosombo on the banks of the Volta River. This is a guest house with approximately 1000 sq. ft. for one bedroom, a main space for the living/dining/kitchen areas and a multi-purpose room which will act as studio. The Gypsy Farm Adventure chronicles several years in the life of the Newberry family while they build a hybrid earthbag, cob, strawbale, pole frame, ferrocement home in Georgia. "I will continue this journey we once called a Newberry adventure, yet today I see this small adventure as part of a greater journey with it's connections to the others on this planet as we travel together." La Casa de Tierra is a rental house located in Ojochal, also called Playa Tortuga (Turtle Beach), on the Southern Pacific coast in Costa Rica. Judy and her son live on the island of Dominica. They are working to build a earthbag home for Judy. The idea of an earthbag home is that it is resistant to extreme climate occurrences such as hurricanes and tornadoes. It is also supposed to be able to handle earthquakes. Judy hopes to be prepared to deal with whatever challenges come her way. We spent a year intensively researching alternatives to mainstream building techniques and settled on a plan that fit our very small budget, was simple and low tech, that two reasonably fit persons could build alone. We chose to build a Buddhist Hermitage, which will be the primary residence for the hermitage staff. After months of design work the dome shape was rejected, in favor of sqaure corners and straight walls to accomodate living spaces inside. We are in the midst of constructing earthbag huts in Northern Uganda. The first hut is nearly complete--and has drawn a lot of attention. The photos show the beginning stages of a “vision” God gave us, to build homes for all of our employees and their families, fellow laborers as well as a home for our family and a potential discipleship training school.